This is a Post from the Symbol Surfing Blog from Thu, Oct 4, 2018. So it's already October. 2019 is around the corner. Wow. Speaking of fun, I was Symbol Surfing the Golden Cross page and there are a few stocks that look good. The 2nd company in the list is Alaska Air and it looks really good. I already own this stock. I purchased some shares of this Dow Transport back on Fri, May 25, 2018. If you don't have time to read the blog post, I was betting that the positive news about lower gas prices would spark the reversal in the downtrend. 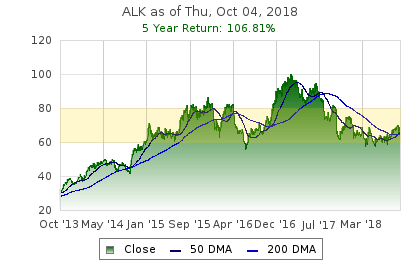 ALK was a relatively riskier choice as it was near the 52 week low. Also, the 1-year return was -28% at the time. At the same time, I thought this stock could have the biggest upside. The stock continued to run up into earnings and I held on. The earnings announcement was well received by the market. Now, I am up about 10%. The golden cross is a bullish chart pattern that occurs when the 50-day moving average crosses through the 200-day moving average. I think technical analysis is real but I do not solely rely on it. 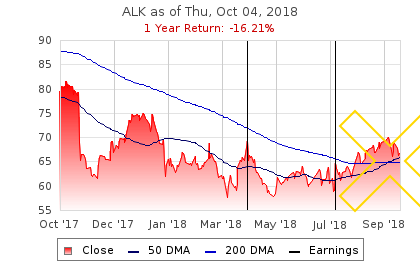 The golden cross is just another reason why I will continue to hold this stock. The 5-year chart shows a trading range between $60 and $80. Also, keep in mind, the all-time high was $101.43 on Wed, Mar 1, 2017. The stock pulled back down to a 52 week low of $57.53 on Mon, May 21, 2018. I bought 4 days later. So I am holding on for now. Maybe it gets to $80 or higher longer term.